It’s been a topsy turvy season for the men’s soccer team, they have produced plenty of decent attacking performances but have been unable to make the most of their opportunities. Injuries to the team’s best player, Mitchell Popadynetz, have made things even trickier, but despite all the challenges TRU managed to qualify for the playoffs after a big week at home. 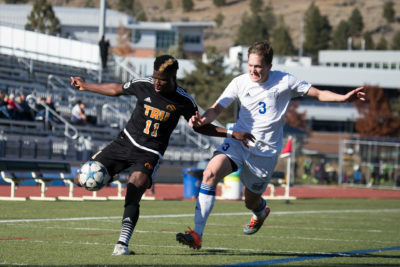 TRU made a good start by beating Trinity Western 2-1 on Oct. 17 at Hillside Stadium. The team went into halftime with the game tied at 0-0, after what had largely been an entertaining first half. TRU created some really meaningful chances that Trinity Western keeper, Sebastian Colyn, kept out. The second half started with a bang as Aidan Moore scored the opener for the Spartans in the fifty-fourth minute. Ten minutes later Popadynetz restored parity with his first goal of the season. The game seemed to be heading towards another frustrating draw for TRU, but cometh the hour, cometh the man, Joshua Banton scored in the ninety-first minute to give TRU a big win. “It was one of those games where finally we got a couple of things going our way at the end of the game,” said WolfPack head coach John Antulov to TRU athletics. TRU followed up that performance with a 4-1 rout of the UVIC Vikes. The game was played at Hillside Stadium on Oct.20. It was a performance that showed the attacking talent that the team has and showcased the importance of Mitchell Popadynetz to this team. In a team all players matter, they all play an essential role in helping getting the desired outcome. Coaches tend to avoid making it about one player, for the good of team unity of course, but sometimes the influence of a single individual cannot be ignored and this applies with Popadynetz and this ’Pack team. Popadynetz scored a goal and had three assists in the game against the Vikes, his performance came at the right time and at a key part of the season. Popadynetz missed four straight games and was taken off early due to injury in the last game before the bye, his presence in attack had been missed despite the team putting on some decent displays. Popadynetz isn’t the only good attacking player in the team, but he will be key if TRU are going to go far in the playoffs. “I thought we played really solid from front to back, defensively we’ve been good, we’ve been scoring goals when we need them,” Antulov said. TRU then beat the UBC Thunderbirds, the number one team in the country, 1-0, to secure their playoff spot. The game was played at Hillside Stadium on Oct. 21 on a bright and sunny Sunday afternoon. TRU was disciplined and produced a true team performance. Every player contributed defensively and the team did enough offensively to win. The first half was extremely tight with neither team giving anything away, TRU looked to be the more dangerous of the two sides, however. The atmosphere was fantastic. Tension was in the air due to the importance of the game for TRU. You could cut the tension with a knife. Joshua Banton headed in the ball off of a free kick in injury time of the first half, the free kick was awarded to TRU after James Fraser was fouled. Koffi Nyavor almost made it 2-0 in the seventieth minute but was unable to keep the ball down. TRU had to do plenty of defending to close out the game, but UBC, other than one or two chances, never looked like they were going to score. UBC looked devoid of ideas and lacked creativity, something that can be attributed to TRU and its great organization in defense. “The guys just battled and gutted it out, it was just fantastic the way they played,” Antulov said. Antulov was also very happy with the way his team was able to play both sides of the game. “Being able to do both is very important, especially in the playoffs,” he added. Antulov had high praise for Banton who he believes is the best defender in the country. The men’s WolfPack team will move on to play Alberta in the playoffs, ’Pack nation will be hoping they can make it four wins out of four.